‘Oh what a night, Late September back in sixty three’…. 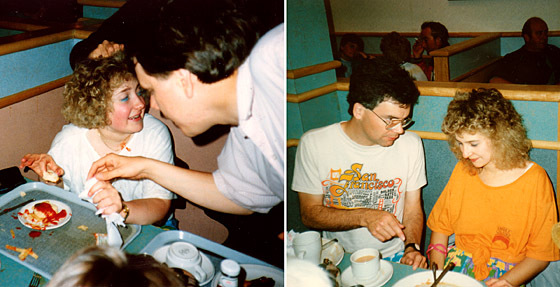 erm, no… actually ‘Oh what a night, Late June nineteen eighty nine’ – What a very special night. The venue was the Northgate Arena in Chester, the event of course, the 1989 Chester Beach Party. This particular year’s beach party was one of my favourite Plus events of all time I don’t know what it was about it, could have been the company, could have been the vodka, could have been the blue Bols, or the journey home, or all of it. 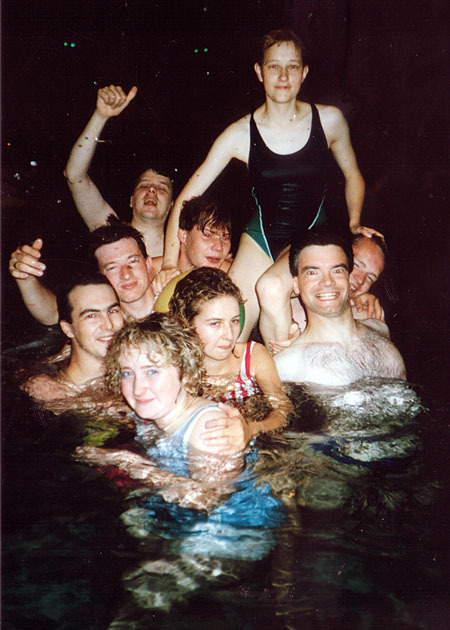 Anyway, back in the 80’s there was a ‘National’ 18 Plus event held every year in the big sports centre in Chester, started off with an evening swimming session in the leisure pool, which had a beach area with plants and an elephant ! a slide and proper lanes to swim in in the deep end – and a poolside bar, then the evening progressed into the main function room for a summer disco until the early hours. We needed a minibus to take all the 15 or 16 Waffledalers to the party, so we would have got there about 8.00 to go swimming. In the pool it was all throwing beach balls, climbing on inflatables, sliding down the slide and generally doing all the things that you are not allowed to do in swimming pools, running, bombing, horseplay, petting, etc etc. After about an hour of swimming we gave it up and went to get showered and changed. This took more time than it could have as Ibbo and I sat on the floor in the showers with the hot water spraying down upon us sharing a half bottle of Vodka that I’d taken with me, we were there for about half an hour, and the vodka got steadily diluted as the water showered into the bottle ! The dancing part of the evening went off without any major happenings, my friends Mandy and Jo from Kidderminster were there and at that time were either drinking blue Bols and vodka… or lager and orange so we had a few of them and generally had a great time. 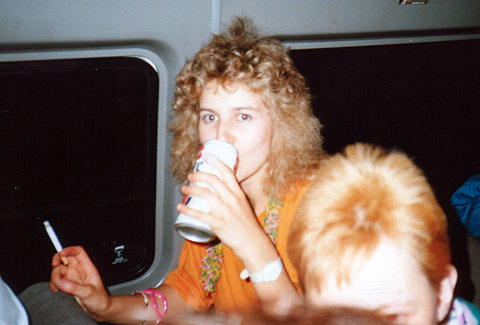 The journey home in a minibus was always fun, the journeys there were always entertaining cos we were all young and silly, but on the way home we were all intoxicated with both alcohol (except the driver of course) and the excitement of the event. More alcohol was drunk and for some reason cigarettes were smoked… by people who didn’t smoke (Cozbert in particular was noted for demanding cigarettes and then ‘smoking’ them without ever inhaling). I was sat on a table next to Cozbert, with Malibu Mel and Zippy on the other side, having a bit of banter when Malibu Mel, failing to get the tomato sauce to come out of the bottle shakes it hard enough that it spurts out all over her plate and a drop splashes onto Cozbert… who picks a chip off her plate and throws it at Mel… it then all got very silly, with chips and tomato sauce flying all over. I managed to move away quick enough to avoid it, but Zippy, who was sat quietly, much to her annoyance got tomato sauce on her coat. After the clag stop, the tiredness kicked in so the rest of the journey home was a bit quieter, well it was half three, four o’clock before we got back home. It really was a great night out, one of the very best.